December 30th was a special day for newlyweds Kelly and Jim Thompson who call Jacksonville, Florida home. Guests gathered at San Antonio Country Club for an afternoon reception in their honor. Parents Lynn and Jim Thompson, Martha and Gordon Smith, Sarah Forney, Loretta Patterson, Bunkie Shed and daughter Shelbie Shed, Leslie Kuhn and her granddaughter Nora, Dina and Lott McIlhenny, Kathie Thrift Buff, Kate and Bill Kingman and their children Jenna and Will, Libby and Tate, and Betty; Brad Freeman – wearing his hand dipped Makers Mark bow tie, Ellen and Harry Schwethelm, Suzanne Goudge, Judge David Peeples, Kristiana Keahey, Lellen and Rick Lane, and their children Emily and Minnie, Melissa and Bob Vaughan, Tera and Jim Doerr, with her mother Erlece Allen, Karen and Duane Westerman, Carol and David West, and son Bond West, Jenny and Nick Campbell, Linda and Herb Hill and daughter Josephine, Shelly and Bob Gunn, Rev. Dr. Bob Fuller and wife Morgan, Rosemarie Banack, Charlotte Hains, Larry and Kim Smith, Mary Frances and Frank Churchill, Jane Ann and Devereaux Temple, Janie Everhart and Vicki and John Boyce, Pat Stanley, Sallie and Tom Guy, Patrice and Joey Oliver, Katie and Blake Loftus and Patrice Stanley Pryor with husband Jason, and children Loren and Jacob, were a handful of guests congratulating the happy newlyweds on their recent nuptials. The happy couple married in October on St. Simons Island, Georgia, honeymooned in Galápagos Islands, and currently reside in Jacksonville, Florida. Two bars featured cocktails-a special cocktail and fave for Kelly and Jim each. Kelly’s choice – Cumberland Horse Kick and Jim’s choice-Dusty Bourbon, and a nod to the honeymoon theme-Galápagos Is- lands-seashells and starfish were displayed on tables, printed on the invite, and utilized in the flower arrangements created by Danny Cuellar. (Must have been Lynn’s idea from Live Oak Garden Club arrangements designed over the years.) The perfect ending/party favor: A Texas praline with a custom sticker: A Sweet Georgia Gal Meets a Texas Nut ~ Enjoy a Praline from Kelly and Jim. Congrats you two!! 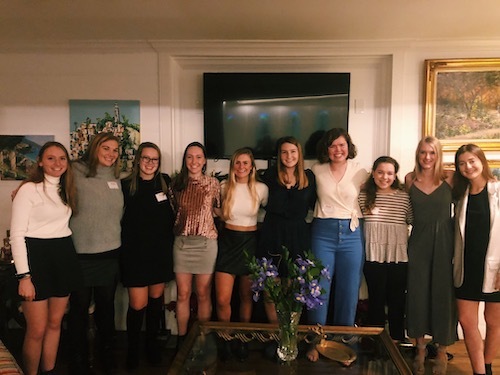 Kappa Kappa Gamma (KKG) hosted a holiday tea to honor Kappa actives and their mothers at the home of Courtney Banack Schultz following the Christmas holiday. Attendees included McKenzie Elizabeth Schultz, KKG Brook Rosser, and her mother KKG Terry Gay Puckett, Debi Flume, Angela Jefferies-Wagner, Hannah Schaeffer, Tara Hart Gibbs, Mary Ann Randolph, Susan Frey, Traci Hunter and daughter Paige Gotlieb, and KKG Alumnae Past Presidents- Martha Steves, Susan Chandler, Francie Calgaard, and Charlotte Bell Milner; and collegiates-Sally Randolph, Martha Milner, Kathleen Calgaard, Faith Flume, Analiese Wagner, Jenna Frey, Anna Catherine Gibbs. Numerous friends from the Live Oak Garden Club Holiday Coffee met at the home of Jan Davis. Jan has a collection of Santas like never seen before! Lead hostess Nancy Avellar made delicious cheese grits, and Irene Shaw, Liz Ressmann, Lisa Swann, Mary Lou Vielock, realtor Susan Bowman, Xonia Kargl, Loretta Patterson, Lynn Thomp- son, Liz Chiego, Pat Krueger, Mary Wofford, Kathie Thrift Buff, Victoria Wood, and Leslie Zinsmeyer were a few of the many in attendance. The committee met 6 days later at the home of president Victoria Wood, and with the help of Leslie Zinsmeyer and other members, assembled goodie bags for tuberculosis patients at the Texas Center of Infectious Diseases. The Garden Club’s flower show will be held April 12th at the Stillwell House at Fort Sam Houston. 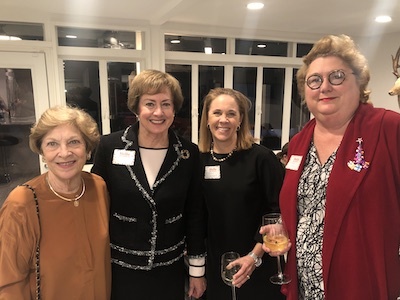 Chairs Helen Bryan and Marilyn Looney with co-chairs Loretta Patterson and Evelyn Williams and hostess chair Sylvia Samano have been planning all year. If you have never had the opportunity to go to a Garden Club flower show, you will want to try and make it this year. The creativ- ity of our local San Antonio gardeners, designers and flower arrangers is amazing. You can’t believe the creativity of our local San Antonio gardeners, designers and floral arrangers! On a sad note, Beverly Worth, life member since ’61, passed away recently and Scottie Huff, a long-time member passed away in January. 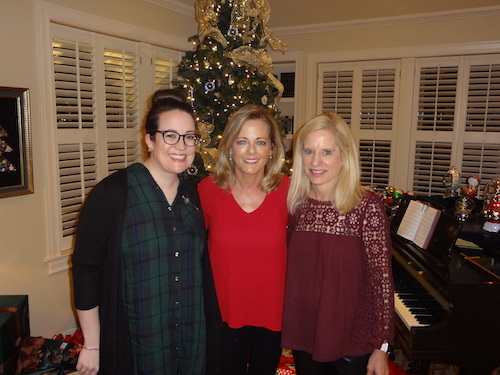 The annual Pine Party was hosted by San Antonio Tri Deltas to honor Tri Delta alumnae, collegiate members and their mothers, and upcoming legacy daughters/sisters. 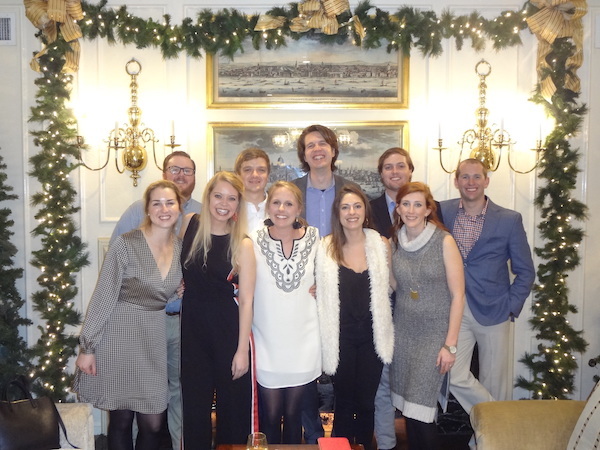 This annual Pine Party event, held at alumni Judy Kruger’s home which was decorated to look like a gingerbread house, was attended by president Alta Compton, Amy Hawk, Dacota Haselwood, Delaina, Harrison with daughters Ainslee and Aubrey, Gina Langford, Janette Prichard, Kay Bashara, Libby Rokowski, Madelyn Duffey, Mary Beth Murphree; mom Mary Kraft with daughters Katie and Elizabeth, Susan and Abby Dotter and hostess Susie Patterson. 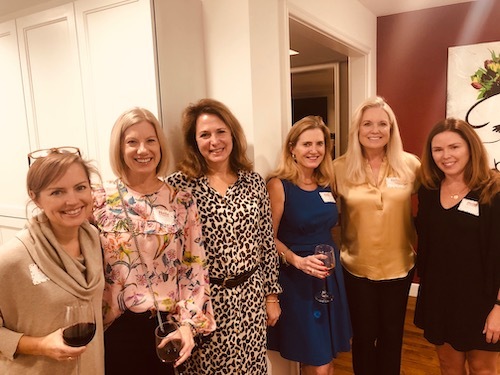 Sweets, sips, Santa and spirits…always a great combination for Nutcracker Sweets, the annual holiday fundraising event benefiting the Battered Women and Children’s Shelter. Vendors included: Chris Conger with The Smoke Shack BBQ, Chefs Bruce Auden and Amy Delbridge with Biga on the Banks, and Paloma Blanca Mexican Cuisine, to list a few. Aldonza Wines, featuring the SA300 Tricentennial Wine was sampled as well. The Children’s Ballet of San Antonio performed and Santa offered kids and families photo ops. President/CEO Marta Prada-Peláez and her executive committee Wayne D. Terry, Christy Prescott, Mark Jimenez, Matthew Pepping, Jr., and Cheryl Thomas oversaw another successful event, raffle of assorted items and a silent auction filled with trips, getaways, jewelry, Spurs tickets and the sale of nutcrackers. Another sweet event in the bag! Organized by the McNay, American Dreams: Classic Cars and Postwar Paintings explores the ingenuity and innovation of postwar America. This period, known as America’s Golden Age, witnessed the explosion of Abstract Expressionism, Pop art, and Op art; the mass production of automobiles; and in- creased wealth and consumerism. The exhibition presents 10 classic cars as modern sculpture, alongside paintings from the McNay’s collection and select loans. Characterized by exaggerated tailfins, wraparound windshields, and generous chrome detail, these classics of the 1950s and 1960s were called dream cars. From a rare 1948 Tucker Torpedo—one of only 51 Tuckers ever made—to the beloved 1963 Chevrolet Corvette, a pinnacle of vintage ’Vette design, many of the cars on view pushed design boundaries through expansive volume, nontraditional color combinations, and highly styled flourishes. Additional highlights include a 1957 Pontiac Star Chief convertible with missile-shaped side trim and a 1956 DeSoto Firedome sporting factory colors of pink and iridescent plum. Classics restored to factory-correct interiors and exteriors are joined by several restoration-modification (“resto-mod”) cars, most notably the Spurs Camaro restored and generously lent by Larry Mills, Executive Vice President, Holt Companies.